Gettysburg Licensed Battlefield Guide Rich Kohr is kneeling near the grave of Captain Charles Curtis MacConnell on the right. On the left is Evelyn MacConnell. At Gettysburg, MacConnell was a Lieutenant in Battery I 5th United States Artillery. He took command after the battery on July 2, 1863 after Captain Malbone Watson was wounded. MacConnell was promoted to Captain with date of rank of July 2, 1863 “for gallant and meritorious service in the battle of Gettysburg.” He retired as a Captain in 1883 after receiving a Surgeon’s Certificate of Disability. This view was taken facing northwest at approximately 3:00 PM on Sunday, December 5, 2010. To see the previous posts on Gettysburg at Arlington, click here. 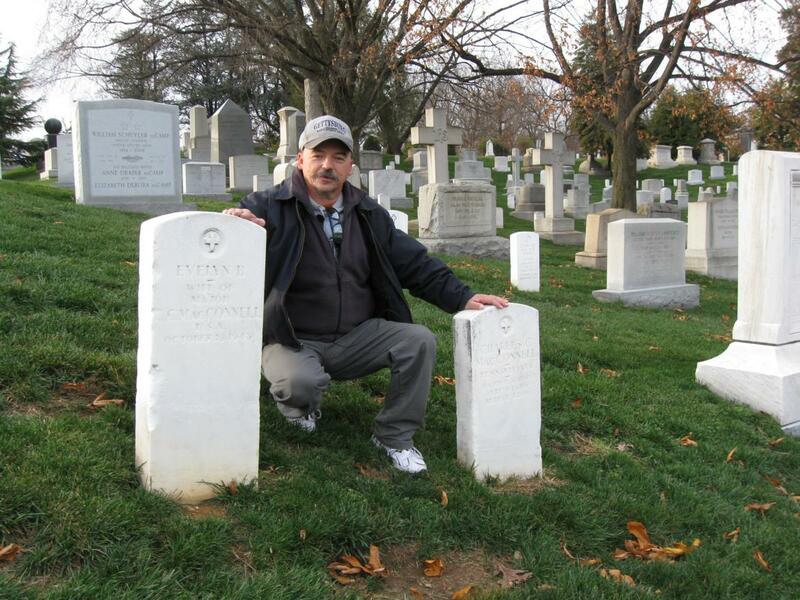 In today’s Arlington post, Gettysburg Licensed Battlefield Guide Rich Kohr shows the graves of Lieutenant Charles C. MacConnell, Captain Azor H. Nickerson, and John Hancock. 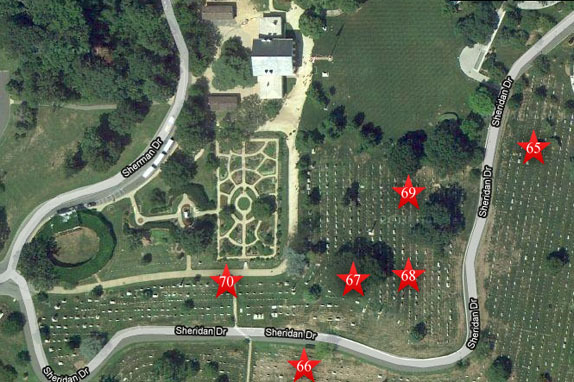 This map shows us the locations taken of videos for our Gettysburg at Arlington series. Videos #1-#64 were shown in our previous Arlington posts. Video #65 was taken at the grave of William H. Raymond. Video #66 was taken at the graves of George Breck and David Neely. Video #67 was taken at the graves of Joseph Bartlett, Martin McMahon, and Evan Thomas. Video #68 was taken at the grave of Charles Curtis MacConnell. Video #69 was taken at the grave of Captain Azor H. Nickerson. Video #70 was taken at the grave of Major John Hancock. This map was created facing north at approximately 3:00 PM on Saturday, January 1, 2011. In Video #68 (Videos #1 – #67 were shown in our previous Arlington posts) Gettysburg Licensed Battlefield Guide Rich Kohr presents some biographical information on Lieutenant Charles C. McConnell who commanded Battery I, 5th United States Artillery on July 2, 1863 after the battery’s Captain, Malbone Watson was wounded. This view was taken facing northeast to northwest at approximately 3:00 PM on Sunday, December 5, 2010. 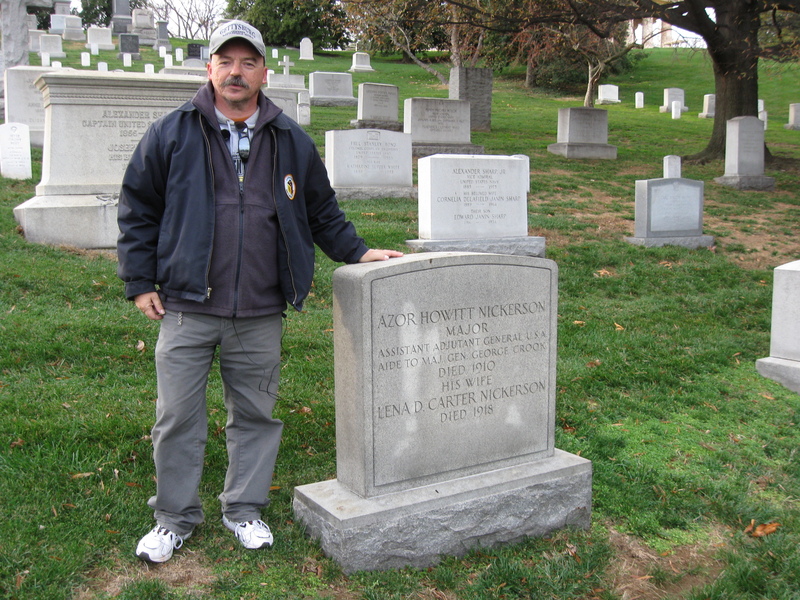 Licensed Battlefield Guide Rich Kohr is standing by the grave of Azor Howitt Nickerson. Nickerson is buried with his third wife, Lena Diller Carter the dressmaker for his second wife. Nickerson sent his second wife, Emma Cecilia Derby Nickerson to Europe, telling her that he had financial problems, and that it was cheaper for her to live in Europe and raise their child there than it was the United States. After she left, he claimed that she had abandoned him, divorced her, and married Lena D. Carter, the dressmaker. This view was taken facing northwest at approximately 3:00 PM on Sunday, December 5, 2010. In Video #69 Licensed Battlefield Guide Rich Kohr presents some information on Azor Howitt Nickerson including the scandal that ruined his career. The Nickerson v. Nickerson case made it to the United States Supreme Court. This view was taken facing northeast to northwest at approximately 3:00 PM on Sunday, December 5, 2010. 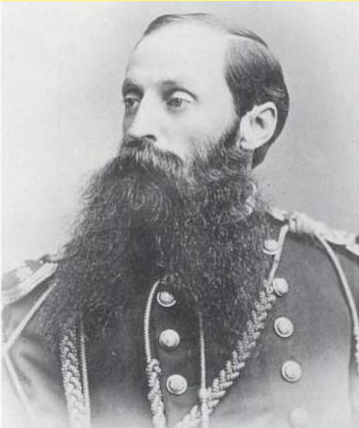 Captain Azor H. Nickerson (1837-1910) of the 8th Ohio Infantry Regiment was wounded at Antietam and on July 3, 1863 at Gettysburg when his unit attempted to repulse “Pickett’s Charge.” His first wife died in 1867 when he was stationed on the western frontier. This is a post Civil War image. 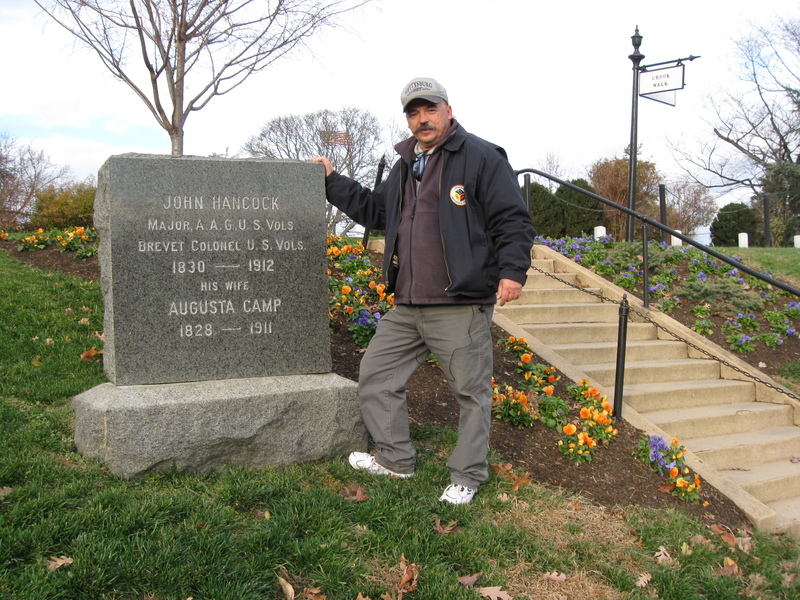 Rich Kohr is standing by Crook Walk at the grave of Major John Hancock, the brother of Major General Winfield Scott Hancock. The flag in the background is near the Arlington House. This view was taken facing northeast at approximately 3:00 PM on Sunday, December 5, 2010. 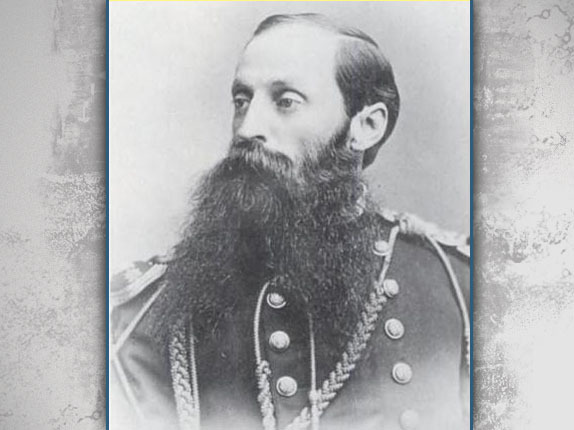 In Video #70 Rich Kohr shares that John Hancock was the Assistant Adjutant General for Caldwell’s Division of the Second Corps at Gettysburg. This view was taken facing northeast at approximately 3:00 PM on Sunday, December 5, 2010.